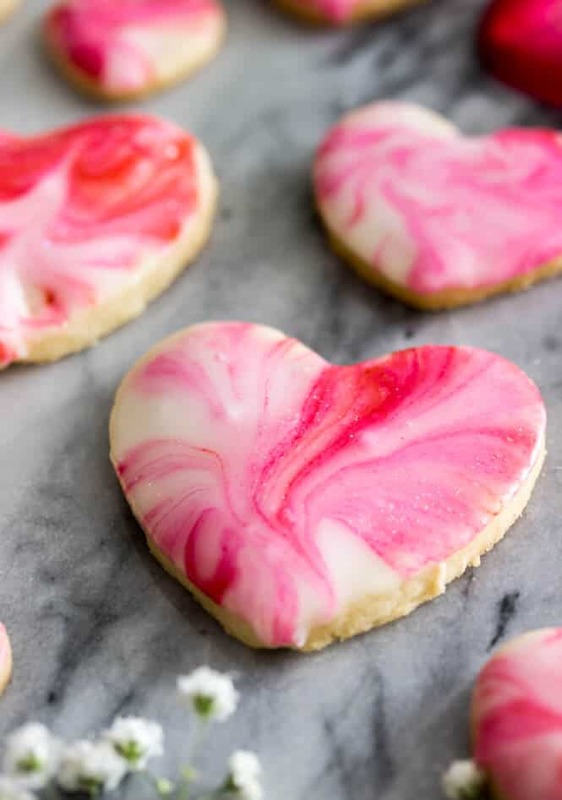 Simple sugar cookies with a marble glaze, these heart cookies would be a sweet Valentine’s treat. These cookies might have waited until next month to be posted. 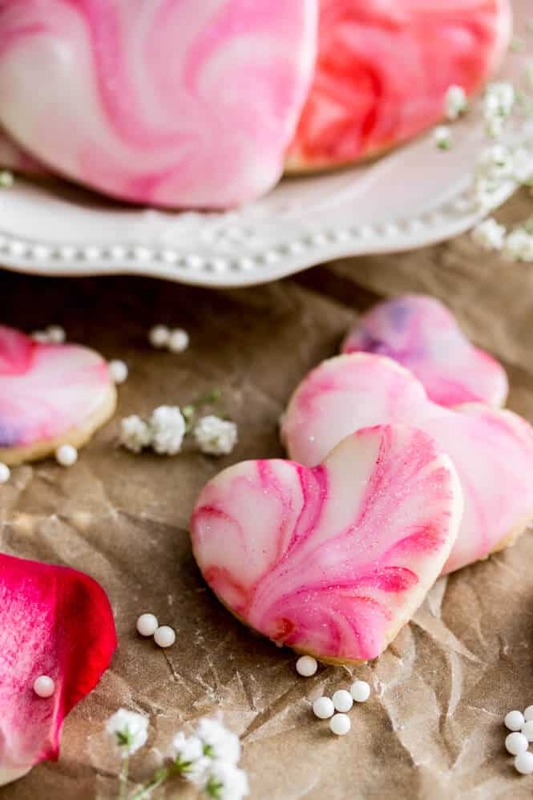 Valentine’s Day is nearly a month away, and these heart cookies would be completely appropriate as a gift for your sweetheart (or, just for yourself!). In fact, I have no less than three other blog posts that I have prepared for you, ones that aren’t pink and colorful and might be better suited as my first true post of 2017. But after exalting 2016 in my last post of the year, it threw me for a loop on the very last day, and 2016 took with it a very big and bright part of my family — my uncle. I don’t want to devote this post to the sadness that slammed our family on New Year’s Eve, or the void that’s been left by his loss — in fact, I didn’t want to talk about this on here at all, but I don’t seem to be able to help myself. Instead, I just want to focus on the bright spots. In the past week, my family has rallied to comfort my uncle’s wife and daughters, and each other, and I’m so grateful for all of the love that family has. Despite the sadness, there has been some light. My uncle’s immediate family has shown more strength, love, and hope in the past week than I ever imagined was possible under such circumstances, and I’ve found myself overwhelmed with gratitude for the close-knit extended family that we share. 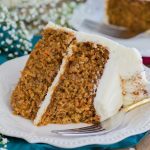 Instead of sharing one of my other recipes that I have ready for you, I wanted to share something bright, and a little symbolic. I spent all morning yesterday swirling pinks, reds, and purples through icing and dipping cookies — baking has always been therapeutic for me, but this time it was especially so. 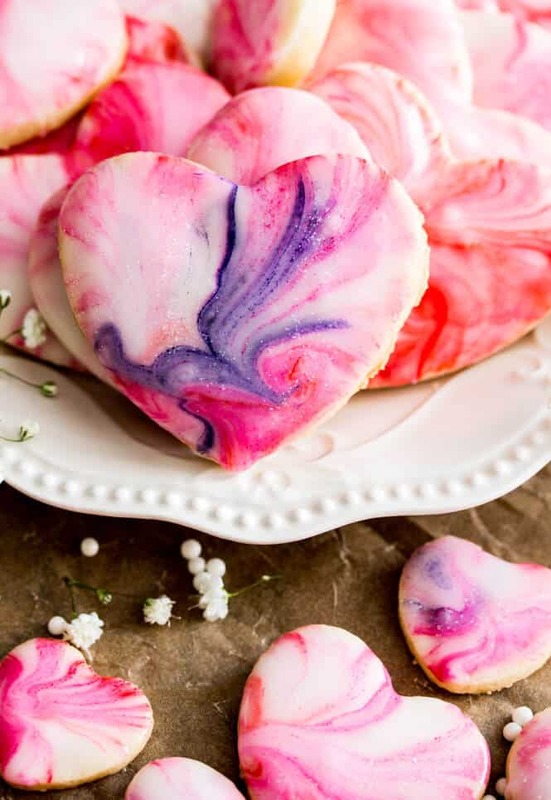 These cookies are made using the same marbling, swirling, technique that I used for my galaxy cookies. 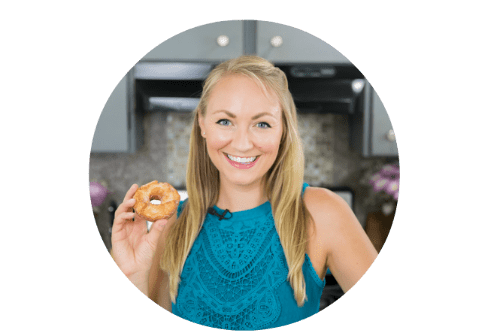 Please see that post if you want step-by-step photos on how the glaze is prepared — it’s much simpler than you might think and is a simple glaze decorated with gel food coloring and swirled with toothpicks. 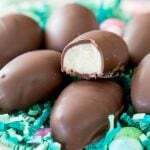 Do make sure you use gel food coloring, which have a rich, vibrant color. Enjoy, and I hope these bring some brightness to your day. 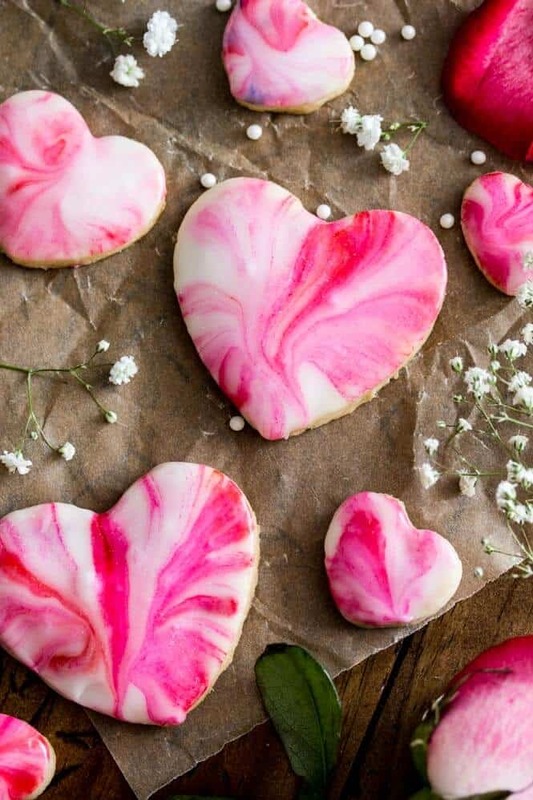 Simple sugar cookies with a marble glaze, these heart cookies would be a sweet Valentine's treat. 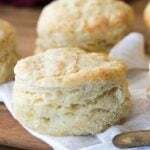 In KitchenAid mixer or with electric hand-mixer beat your butter until well-creamed. Add sugar to the mixing bowl and beat with the butter until well combined (about 30 seconds). 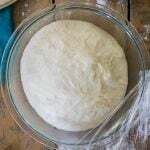 Once dough has chilled, transfer it to a clean, lightly floured surface and use a lightly floured rolling pin to roll out to about 1/4" thickness. 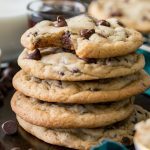 Bake on 350F for 10-12 minutes (longer if you are using larger cookie cutterand allow cookies to cool completely before dipping in chocolate. 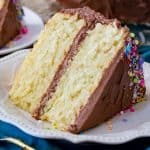 In a large bowl, combine sifted powdered sugar, 3 Tbsp milk, and light corn syrup. Whisk until smooth. If mixture is too dry, add additional milk, one teaspoon at a time until mixture can be stirred. Glaze should be thick, to test that it is the right consistency drop a few droplets on top of a test cookie. If the glaze remains stiff, it needs to be thinned. If it runs off the cookie, it is too thin and needs more powdered sugar. If it settles down smoothly, it is just right. Divide glaze into four small bowls. Working with one bowl at a time, use a toothpick (a different toothpick for each color) and dip it into the food coloring bottle and then into the glaze. You want a small pool of food coloring about the size of a mini chocolate chip or two. Drag a toothpick through the food coloring and glaze until it is prettily swirled/marbled. 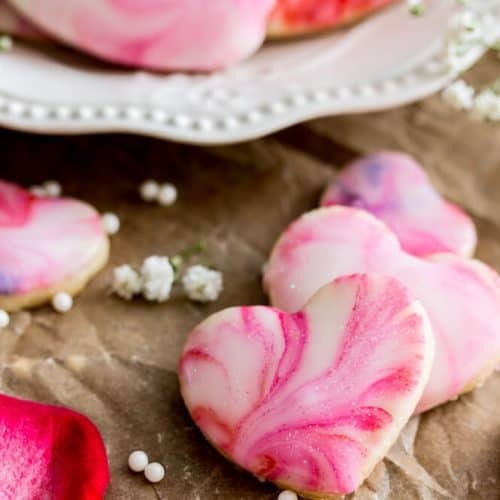 Holding your cookie at the base, dip the surface of each cookie into the glaze (take a look at your first cookie -- are you satisfied with the pattern? Adjust whorls with additional food coloring as needed). Once the first bowl runs out or the colors become too muddled together from dipping, move onto your next bowl of food coloring (you will probably need to stir as the surface may have begun to harden). 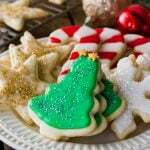 Repeat steps 5-7 until all cookies have been dipped. Allow them to harden at least 30 minutes (may take longer) for glaze to set. Enjoy! 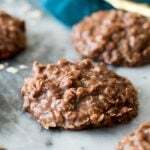 Keep uneaten cookies in an airtight container at room temperature. In memory of my uncle, Ray Parker. Among many other things, Ray was a supporter of The Cystic Fibrosis Foundation, specifically the Maryland Chapter. Please consider making a donation HERE. 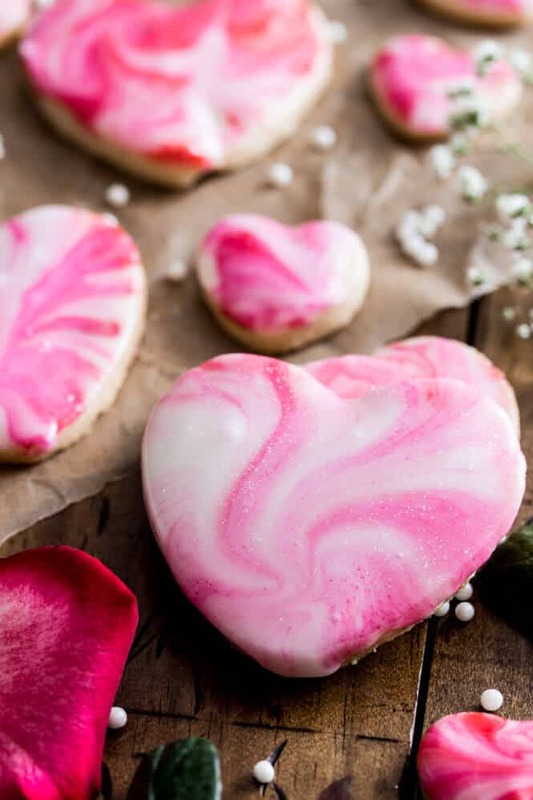 We used the icing on cinnamon shortbread hearts for a bake sale at my stepdaughter’s school. I used golden syrup as we don’t get corn syrup in the UK, and added a teaspoon of gingerbread syrup and some orange extract to the glaze. 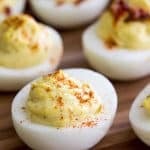 They look fantastic and taste wonderful! I am allergic to almonds. Can I omit the almonds extract? So very sorry to hear about your uncle. 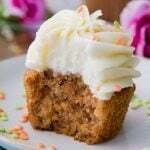 You’re right, baking is therapeutic, good for the soul. 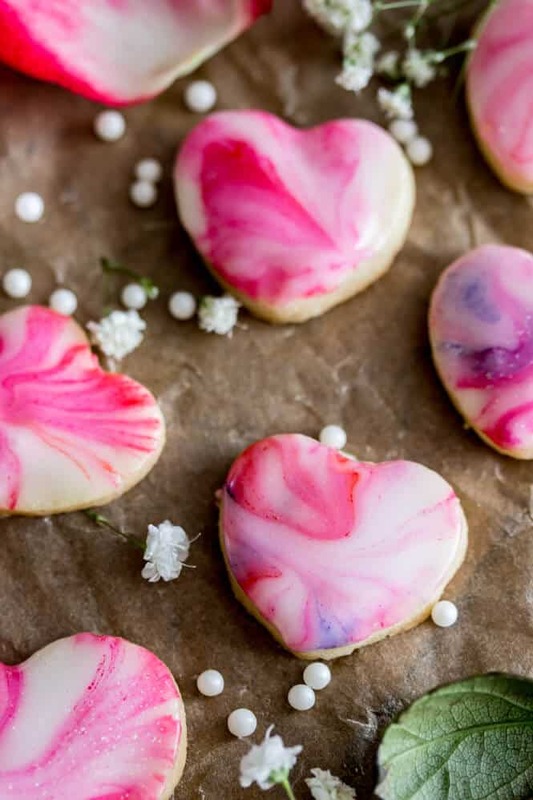 These cookies look beautiful! I’m so sorry to hear about your uncle. What a sad way to end the year. You are in my thoughts! These cookies are beautiful! I have been experimenting with the marbled technique on doughnuts and am obsessed with it (post coming soon!). Now I feel like I need to make cookies, too!